This CDKN case study, Integrating urban agriculture and forestry into climate change action plans – Lessons from Sri Lanka by Marielle Dubbeling of RUAF Foundation, illustrates how the Western Province is promoting urban and peri-urban agriculture and forestry as a strategy to reduce vulnerability to climate change, while at the same time enhancing urban liveability and livelihoods. The Western Province in Sri Lanka is the most urbanised province in the country. Rapid urban growth has posed a number of problems. Ever-increasing vehicle traffic and commercial industries have contributed to increased environmental and air pollution. Food and construction are two major sources of greenhouse gas emissions, including those generated through transport. Large areas of agricultural lands have been converted for residential and commercial land uses, significantly altering natural water flows and drainage. This, coupled with an increase in average rainfall as well as heavy rainfall events, has resulted in recurrent flooding and related damages to infrastructure, utility supply and the urban economy. The Western Province in Sri Lanka is the first provincial government in the country to include urban and peri-urban agriculture and forestry in its climate change adaptation action strategy. The province is promoting the re­habilitation of flood zones through their productive use as a strategy to improve storm water infiltration and mitigate flood risks. It also supports local agriculture to reduce dependence on imports, to lower greenhouse gas emissions and energy require­ments for food production, trans­port and storage, and to improve food security and livelihoods. Future upscaling of these interventions will need new urban design concepts and the devel­opment of a provincial climate change action plan, in parallel with a revision of local and national policies. Achieving this progress on policy will require improved impact moni­toring and awareness raising at all levels of government, partnership and capacity building and local financing. Project results to date have been facilitated by linking project implementation, monitoring and policy-making, building local partnerships and mobilising local funding. However challenges remain with regards to validating the monitoring framework used and improving researchers’ outreach to policy-makers. Policy and programme design are guided by pilot and demonstration activities and impact monitoring. Project results and available monitoring data are directly used in policy-making. The participation of policy-makers (from local, provincial and national government) in the project and monitoring activities allows for this direct flow of information. At the same time, policy-makers can guide researchers on the type of data needed at specific points in time. Project results are already being upscaled from Kesbewa to Colombo areas, where abandoned paddy areas are being rehabilitated following the Kesbewa model. However, since a framework for monitoring impacts of urban and peri-urban agriculture and forestry on climate change was not available at the start of the project, development and testing of such framework is being done while monitoring data are collected. This may imply that certain factors or data are not yet the sufficiently looked into, such as methane emissions from paddy compared with natural bush growth on abandoned paddy lands. Established partnerships among local NGOs, civil society, different levels and sectors of governments, universities and international research and support organisations are essential. Finding a common language and interest among researchers and policy-makers proves difficult at times, but it is crucial for the uptake of results. For example, presenting research data on reductions in GHG emissions in tons of CO2 may have no meaning to policy-makers unless it is compared to impacts of other interventions or presented in other forms like ́the emission or energy equivalent of X urban households’. Individual householders simply want to know how much money they can save by reducing energy costs. Similarly, data on local food production should be presented as a percentage of urban consumption (for specific crops) and linked to land availability and land use potential (i.e. how much food can realistically be locally produced and how much land would it require). In order to define how urban agriculture can best be integrated into climate change and urban development plans or how better production and land use can be promoted as part of agricultural programmes and policies (e.g. the Paddy Act), it is important to review critically and build on existing policies, plans, norms and regulations. Such critical review was helpful in order to identify: i) the extent to which urban agriculture land uses were already integrated into various plans and policies; ii) options to further enhance such integration; and iii) the specific stakeholders to be involved and lobbying strategies to be applied. Assessment, pilot project implementation, impact monitoring and policy formulation during the projects were all co-funded by local partners and international support organisations (UN-Habitat, RUAF/IWMI and CDKN). Inclusion of pilot projects into the operational plans and budgets of the Ministry of Agriculture were crucial for its implementation and follow-up, as external project funding was limited to two cropping cycles only. Funding was assigned from various programmes and departments such as the Divina Naguma home garden programme and the Department of Agrarian Services. The Ministry of Agriculture also made available and funded the participation of their agricultural officers and extension staff, who will play a key role in future upscaling of the activities in the province. (Co-)funding has also been put forward for the development of the Provincial Climate Change Action Plan. Municipal funding is being leveraged for rainwater harvesting and composting equipment. Urban policies need to focus more on building cities that are more resilient to crises. Such policies can best be informed by showcasing best practices and replicable urban agriculture models and integrating policy advocacy and operationalisation into project design from the start. Urban agriculture may be considered as a relevant strategy bringing multiple benefits. Implementing the pilot projects produced tangible results that reinforced the commitment of all stakeholders and informed public policy-making. From the outset, it proved useful to develop pilot projects and actions that offered benefits in the short term, in order to create a positive environment for more complex and long-term policy formulation processes. i) the inclusion of urban agriculture and home gardening in the Kesbewa Urban Development Plan and ii) the Agrarian Services circular, which formally allowed for new forms of cultivation of paddy lands and the future inclusion of urban agriculture in the provincial climate change adaptation action plan. However, unless it is supported by a clear road map and the necessary allocation of resources, policy formulation will not automatically follow the implementation of proposed actions, nor will it result in expected impacts on the ground. 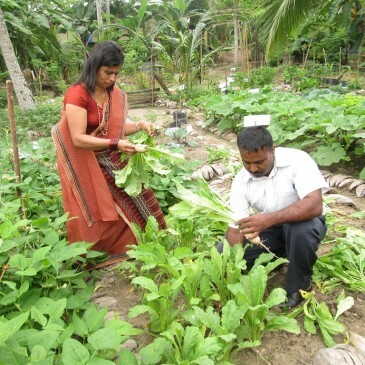 Experiences in Sri Lanka have shown that urban agriculture can help reduce the vulnerability of the urban poor and enhance their coping capacity by: i) diversifying food and income sources; ii) keeping low-lying zones free from construction so that floods have less impact; iii) reducing storm water runoff; and iv) establishing green open spaces that can store floodwaters.